Pediatric Dentistry: Sugar Substitutes, Better for Your Teeth? It is well known that lots of sugar over time can increase the chance of cavities. What about "sugar free" products? What about a diet Coke? Is that as bad as the original? 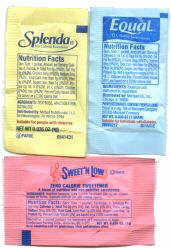 Here are some of the options out there today: Saccharin, Equal, Splenda, Stevia, Susta, Xylitol, Sorbitol, Mannitol, etc. Most people use diet or sugar free products to reduce calories--to diet. Some avoid sugar due to medical conditions like diabetes. What about dental caries? The bacteria that contribute to cavities feed off sugars to produce tooth damaging acids. However, other carbohydrates can be just as bad, or worse. Why? Well, a cracker stuck between the teeth can break down into sugars. The fact it is there for a longer time can make the situation worse. After a sugar "attack" the ph around the teeth goes down (more acid) for about 30 minutes or so. If you can brush within that time, or even just rinse out with water, that will help. The fluoride in the toothpaste helps as well. Will switching to a sugar free product help? Well, maybe. Most of the information out there seems to be on the caloric content of these products not the cariogenic potential. More people are concerned with loosing weight than preventing cavities. The one product where there seems to be a good deal of solid research is Xylitol. It's good in small quantities. You may see this in some chewing gum. There is actually a beneficial effect of Xylitol. See my post here on that: Chewing Gum, Good or Bad? I recommend Xylitol products to my patients based on the research. As far as all the others, well, it is my summation to say I think there is far less potential for cavity formation with sugar substitutes, but the potential is still there to a lesser degree. Just because you switch to a diet coke will not mean you'll never get a cavity. Sucrose may be the worst, but bacteria can find a way to metabolize different compounds in some way. So, if you want to loose weight or have diabetic concerns, you will definitely consider the alternatives to sucrose. The reduced cariogenic potential of the substitutes may be beneficial as well. Be aware that certain products like colas, have other ingredients, like phosphoric acid (to enhance flavor), that may also lower ph. Journal of the American Dental Association Article: Are sugar substitutes also anticariogenic? By the way, do I let my kids have candy? Yes, sometimes, but I look for sugar free and limit the frequency (as much as a dad can), and make sure they brush and floss afterwards. Sweets are a great part of life, and are to be enjoyed. This is really a informative post for readers. In a diet controll drinks such as cola or some soda, sugar substitute is used as a chemical in there. It's a great invension that is useful for human body. I agree that most people are more concerned in losing weight than preventing cavities when taking in sugar. Cavities are somewhat hidden, so they are not given enough attention. It's a good thing that substitutes are made to lessen the chances of getting cavities. Making the people aware regarding the advantages and disadvantages of sugar-free products is an asset of this site. I learned to consider the side-effect of the products you thought are beneficial. It also includes articles that supports the concept. Great job! I want to take care of my teeth but love sweets so much. I put sweet in my coffee, my juice, I even put sweet in my oregano medicine. This site could help readers a lot. A lot of people suffer form diabetes, so this site is a must read. My father use has diabetes. I showed him this post. He very happy to see it. We are waiting for this product to come in BD. Actually sugar isn't as bad for your teeth as starchy foods that stick to them like bread, cakes, potato chips etc. There are many health reasons not to use the sugar substitutes you mentioned. You can find sweet leaf in the grocery stores and it is actually an herb called Stevia that has 20x the sweetening as sugar. It's all natural and safer. This is very helpful for me because I am protecting my daughter's teeth at this moment and at the same time I am looking forward for my father's health because of diabetes. Sometimes we can't avoid drinking cola but this time should really try specially for our kids. This informative post regarding sugar substitutes is great thing. Helping out not only pediatrics but also to adults. Most of our daily foods has a sugar content from snacks, candies and even meals.By this sugar substitutes it helps out to decrease the rising cases of cavities all over the world, saving our teeth and even our health in general. Furthermore, drinking water and toothbrushing are important means too. This article is wonderful! I just had a very similar conversation with my dentist, Dr. Hanna. He pretty much agreed spot on with the information and suggestions you have here. Thanks again, you've hopefully helped me save my teeth! Products that says sugar free, i think it's not possible. They should only say less sugar. sugar is also needed for our body but we should know the content of our daily food intake. For those products that are sugar free, i think its possible maybe it could be less sugar, people has its minimum daily sugar intake. it would be great if we know the sugar level of the food we eat regardless of the cavities that could affect our teeth. This is the most helpful, informative, straight to the point website I've found so far. My 4 year old son just had 6 teeth capped, 6 cavaties filled, two teeth pulled and 5 nerve damage treatments. I did not realize the effect that letting have one more cookie or one more peice of candy would have on his teeth. Now I am brushing and flossing his teeth twice a day. I've also adjusted his diet. I wasn't sure if sugar free foods were better or worse for his teeth. So I've been doing research and this one is the most beneficial. Now I know what to look for when I buy food. It's amazing how little we know about things like sugar free. We just assume they are better but we don't know why. Thanks for explaining! I keep my children not to eat or drink carelessly. I also give them candy but I have to tell them to brush their teeth afterwards. I agree if the candy is part of the world that must be enjoyed by children. By the way, what is the cause of dental caries? It is a bacteriological process, an infection. The sugars and carbohydrates feed the bacteria.